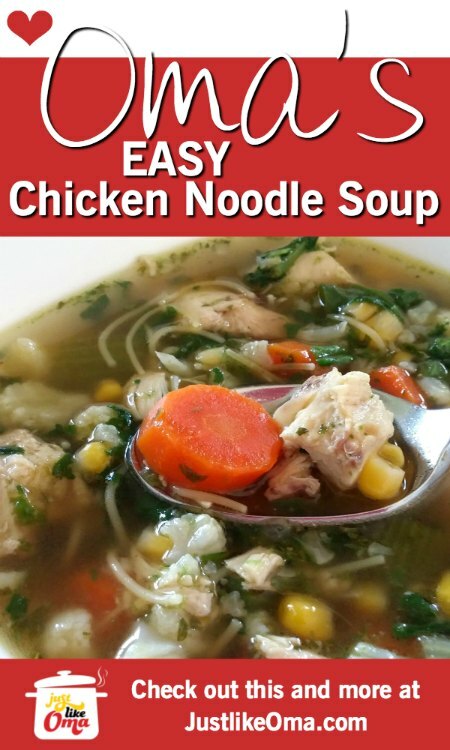 Make my easy chicken noodle soup recipe made from scratch! 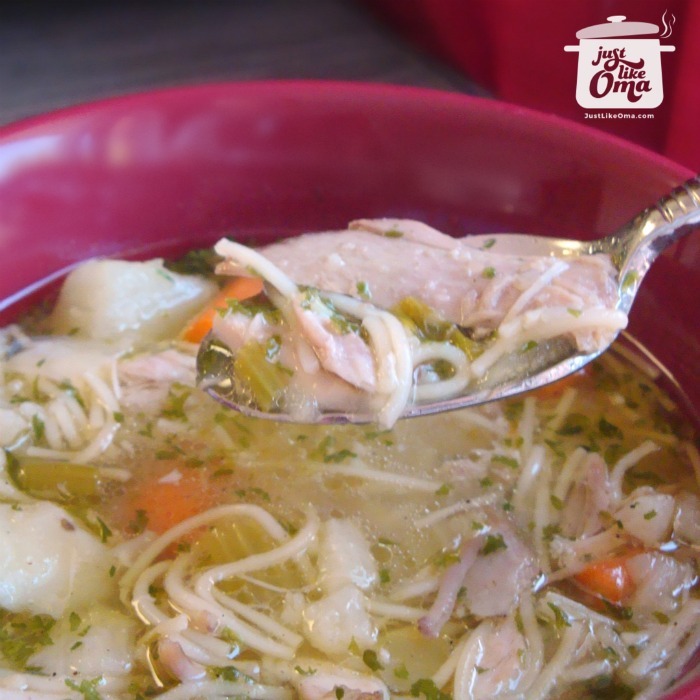 Yes, you could make this using store-bought chicken broth. But why pay more for something that doesn't taste as great as home-made? Buy the least expensive chicken you can - whole or parts - and simmer with soup veggies to make a stock that's really flavorful. You can also be creative and use barley or rice instead. And then add whatever veggies you like! Hühner-Nudelsuppe! Oma-style! 1 - 2 parsnips, leek stalks, etc. Remove visible fat from chicken. Put chicken into large pot and cover with water. Add remaining ingredients. Bring to boil. Reduce heat, cover, and simmer about 1 hour until chicken is tender. Occasionally skim foam from top during simmering time. Remove chicken pieces. Strain cooking liquid through sieve, saving liquid and discarding vegetables. 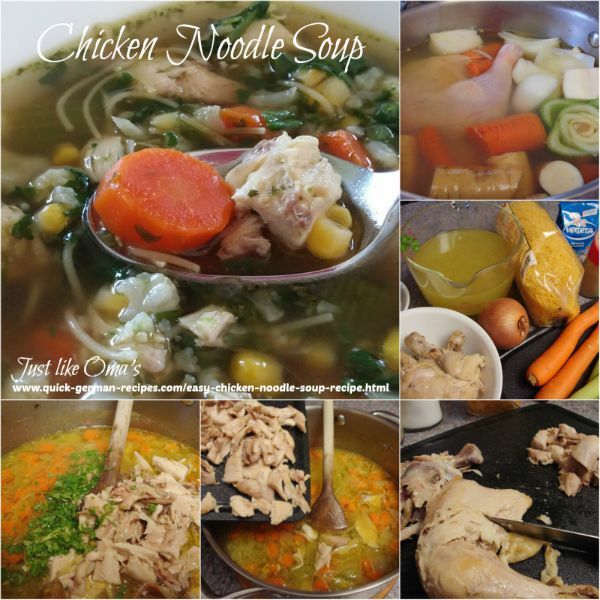 Return stock to pot to continue cooking Chicken Noodle Soup below or refrigerate until needed. Skim fat off top if desired. You can also freeze stock for later use. Remove meat from chicken pieces. Remove nice large pieces for another meal (if desired.) 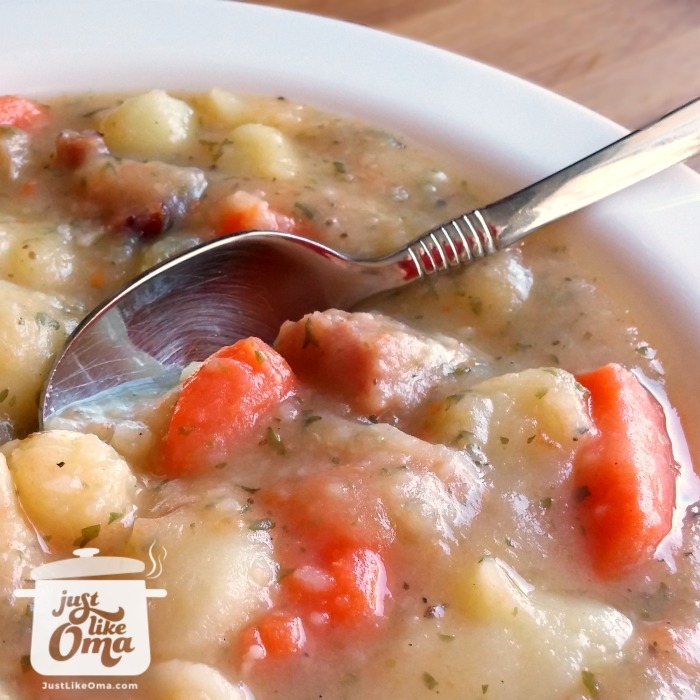 Use smaller pieces for soup. To the stock, add vegetables and bring to boil. 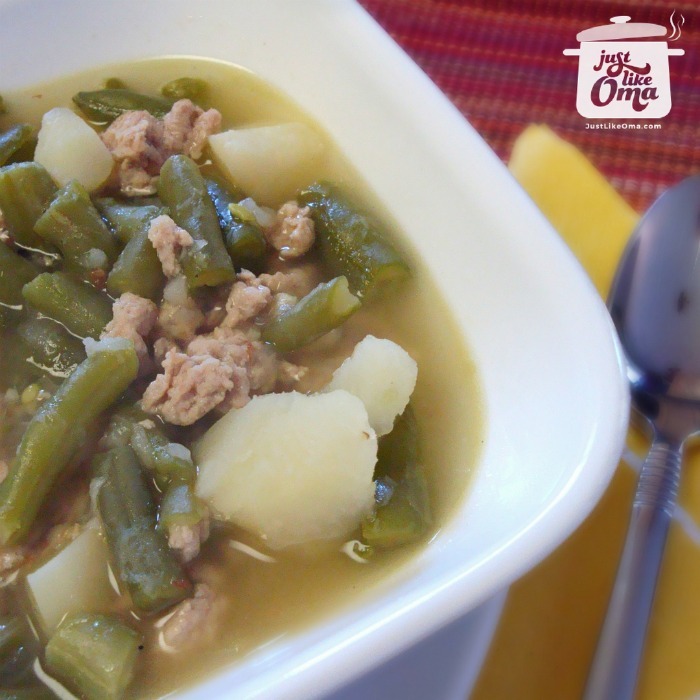 Simmer until vegetables are almost tender, about 15 minutes. Add egg noodles and simmer about 8 - 10 minutes until noodles are tender. 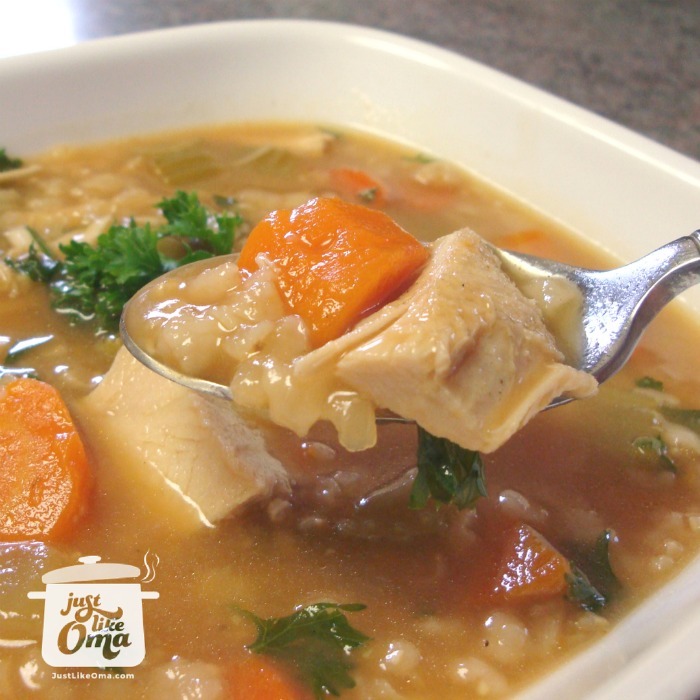 Return chicken meat to soup. Season with additional Vegeta or salt and pepper. Garnish with chopped parsley. Instead of egg noodles, you can use pasta. Small shapes work best - and the kids love them. 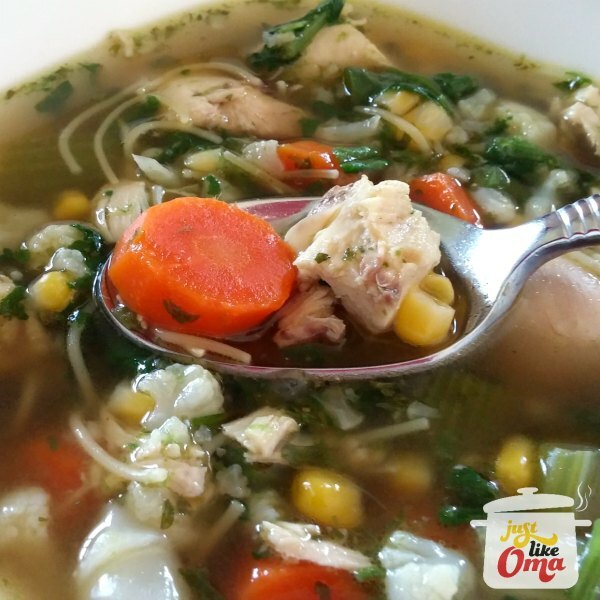 Turn this easy chicken noodle soup recipe into a chicken rice soup by using about ¾ cup long-grained rice with the veggies and simmer about 20 - 25 minutes or take a look at this chicken rice soup recipe. 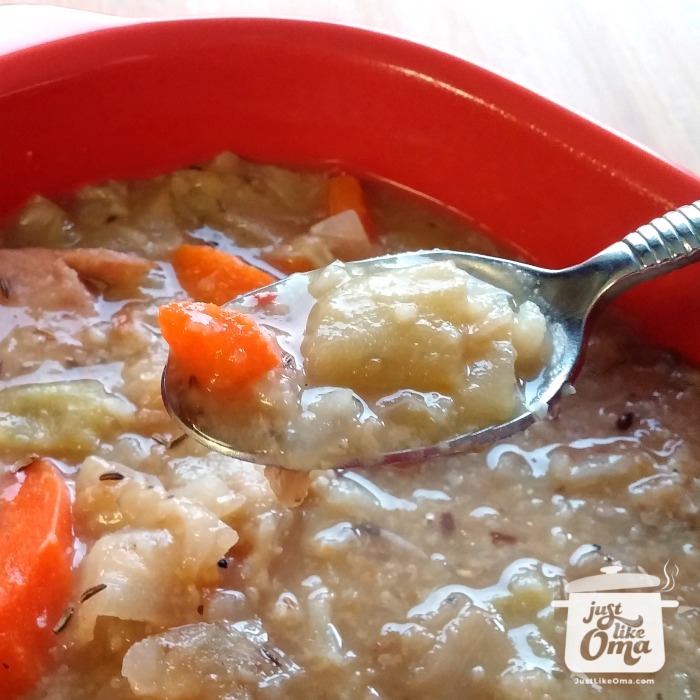 The amount and types of soup veggies you add when cooking the chicken stock is flexible.Use any combination of onions, carrots, parsnips, celery, and/or leeks. This is just to flavor the stock. 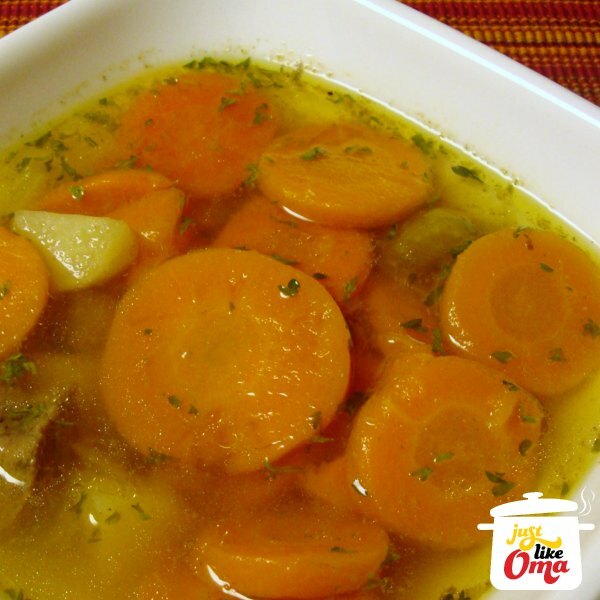 You'll strain the broth and add new veggies when finishing the soup. In the soup pictured here, I've added carrots, cauliflower, green beans, and corn to the stock and cooked it about 10 minutes until the veggies were almost tender. Then I added the noodles and spinach and cooked till the noodles were done ... about 4 minutes for these fine egg noodles. 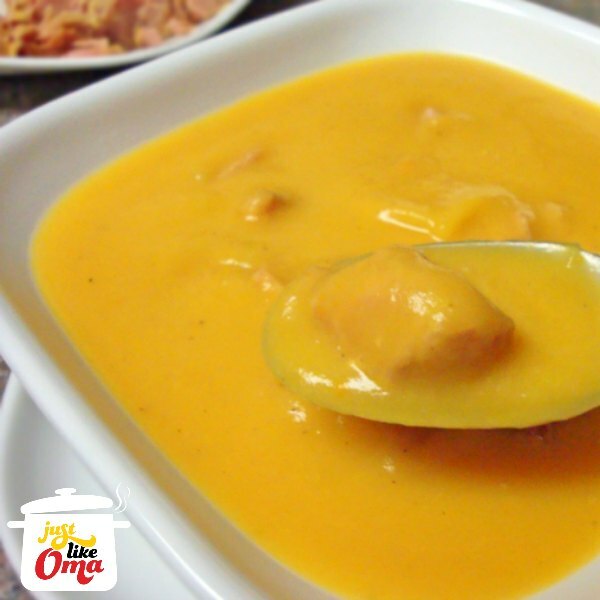 In the recipe above, you'll end up with a delicious broth and are able to use inexpensive cuts of chicken. 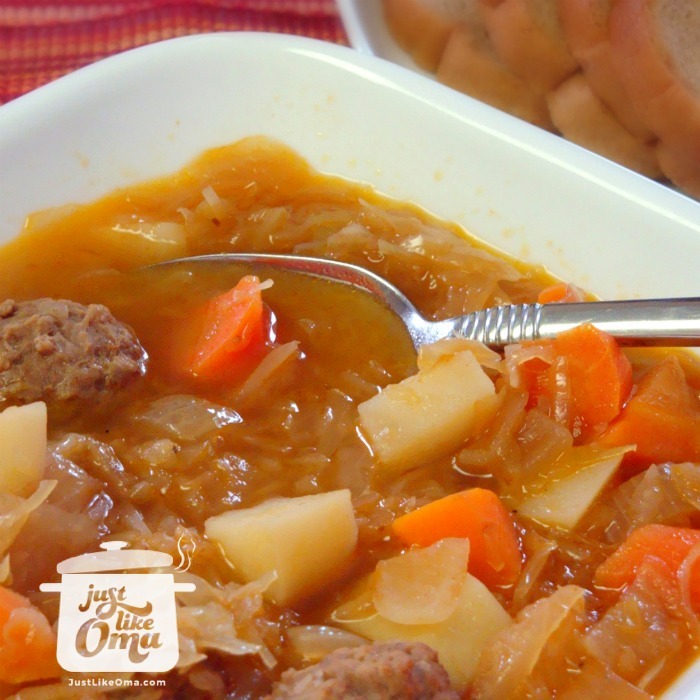 You'll also have meat to put in the soup as well as extra meat to use for another meal. To finish off the soup, use either fine or medium egg noodles. The amount varies depending on how thick you like your soup. Economical and easy! 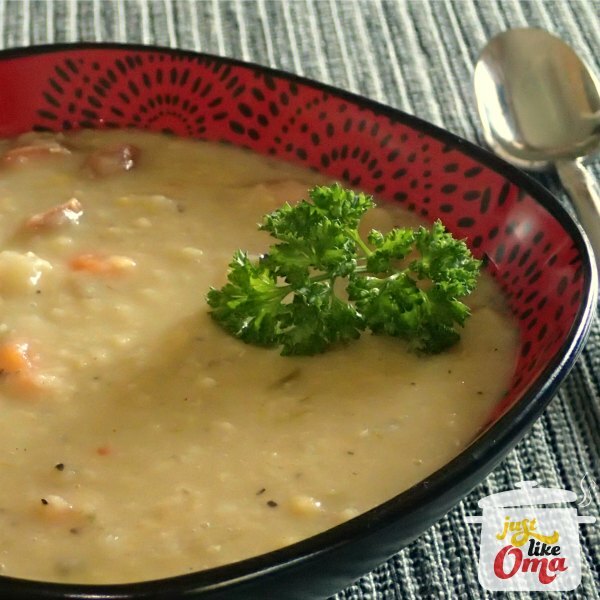 Especially with the hints section at the end of the recipe -- you'll discover how this soup cleans out the veggie crisper! "The man who finds a wife finds a treasure, and he receives favor from the Lord."